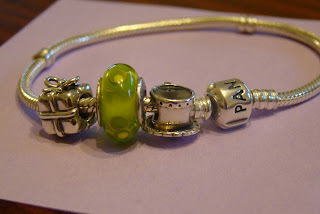 I got the tea cup charm and green bead on the bracelet, and have used birthday money from my parents and inlaws to buy the present charm. I LOVE this bracelet and there are sooo many cool charms and beads that I can look forward to buying in the future. Do any of you have this bracelet - what charms do you like? Monday was actually that start of a busy week, I had my Mum come up and stay for a couple of days, then we have had an Aussie guy come and stay for a few days also on and exchange with hubby's community group. We ended up hosting a bbq/potluck meal on Saturday night, then hubby and a few others took our visitor up to Moeraki for the day on Sunday. I managed to sneak away for a scrapday with some of the Dunedin ladies, however my day was interrupted by having to go back out home and grab spare keys as hubby had locked his keys in the boot of the car at Moeraki!!!! So the Aussie guest got to see the coast line between Dunedin and Moeraki a second time that afternoon!! Now a quiet week, kids all eased back into swimming and rugby, hope to get back into my scrap area (this is in spare room so haven't been in there with visitors staying), and to get some creating done. Love the look of the green bead ... I really need to get some colour for mine also on my wishlist is the bird and the dinosaur. I have the cupcake ... that should be a must have for you! What a great gift! I got gifted mine a couple of weeks ago too, I have the cat charm and the puffed heart. I love the teacup - how cute! Like you I'm looking forward to slowly adding to mine. Hmm I haven't seen the tea cup. My favourite is a little square one which has on it I love(as a heart) you. Love the green bead on it. Mines got 3 so far - frog, present and the rose. The worst bit of having one is trying to decide what you want to get next.